Thanks, Mail Carrier | Do You Have a Little Girl who is Outgoing, Energetic and Charming? Enter Her in the Little Miss Coppertone Contest! Do You Have a Little Girl who is Outgoing, Energetic and Charming? Enter Her in the Little Miss Coppertone Contest! Let's hear it for summer! Hip, hip, hooray! Whether or not the thought of having full days to entertain and play with your children brings joy to your heart or fear to your soul, summer means fun in the sun. Which, in turn, leads to sunscreen, of course! My girls know that it doesn't matter if we're playing at the park, swimming in the pool, strolling through the zoo, vacationing at the beach or simply hanging out in the yard, the sun means sunscreen. And one name that we're sure to reach for time and time again is Coppertone. We love, love, love their new Foaming Lotion! 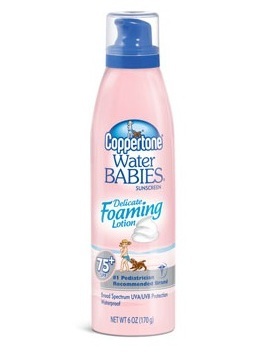 With a product line that is perfect for the whole family, the recognizable image of Little Miss Coppertone (and her puppy biting at her bathing suit) has been on each of Coppertone's items since her introduction in 1953. Each year she continues to make the brand more and more charming! New for 2012? This summer little girls everywhere can get in on the fun with the Little Miss Coppertone Contest, as the brand searches for the one who best personifies the spirit of Coppertone. Entering is simple, as anyone with a little girl ages 2-8 just has to submit a photo of her by June 22nd to Coppertone's Facebook page to enter. Special guest judge Alison Sweeney will lead the judging team in selecting finalists and starting on July 13th, America will vote to choose the next Little Miss Coppertone. The winner gets a dream family vacation and will be featured in a Coppertone print ad! To learn more about the contest, read the official rules and enter, visit the Coppertone Facebook page (no Purchase Necessary. Contest Ends on 6/22/12. Click for Details). What are you waiting for? If you have an adorable little girl in your life who is full of optimism and embodies the outgoing, energetic, wholesome, charming sweetness of Little Miss Coppertone, don't miss this unique and fun opportunity. In the meantime, want to have a little fun of your own? Coppertone knows that every woman is a Coppertone Girl in her own unique way... and now we can find out just what way that is! Just click on the cute picture below to take their quiz to find out the answer: What Kind of Coppertone Girl Are You? Disclosure: This post is part of a compensated campaign with the Coppertone Water MOMs and MomSelect. All thoughts and opinions are my own. You better believe I entered Zoe:) My fingers are crosse! !